This is a list of some of the major nationwide and regional pharmacy chains in Japan where you can purchase OTC medical supplies. This list is by no means complete, but covers many of the major players in the Japanese pharmacy market. 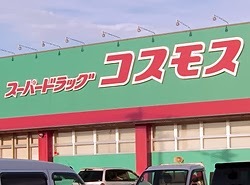 SunDrug is another large chain. They maintain a presence in all 47 prefectures, albeit a token, two or three store presence in several regions. SunDrug seems to be particularly well-represented in the Kanto, Aichi, and Fukuoka areas. 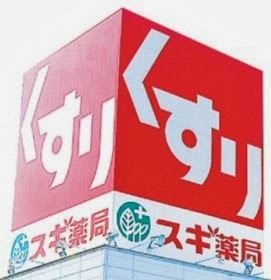 Cocokara Fine is an umbrella company with several branded storefronts, including Seijo, Segami, Zip Drug, Lifort, Suzuran Pharmacy, and (Kusuri no) Kodama. Aside from the requisite Kanto presence, these stores are appear to be fairly well represented in Aichi and the far western parts of Japan, including the Chugoku region and the northern half of Kyushu. The Sugi Drug Group of stores is strong mainly in the central and kansai regions of Japan, specifically Aichi, Gifu, and Osaka. They use a very plain, blatant red sign that straightforwardly reads, くすり: "medicine." Tsuruha Drug is exclusive to Eastern Japan and is easy to find throughout Tokyo and areas northward. It is headquartered in Hokkaido, and has expanded to command an impressive domestic market share, despite its almost complete absence from half of the country. Conversely, Cosmos Pharmacy is completely absent in eastern Japan. Its stores are focused mainly within Kyushu but stretch out to Shikoku and the western portion of Honshu, including Yamaguchi, Hiroshima, Okayama, and Kobe.